Mike…on your last set of plots, what parameter is on the horizontal axis? The horizontal axis is x0, and the vertical axis is z0. I’ll note that in the text. Thanks. Never mind my last comment. I guess you are plotting z0 vs x0. 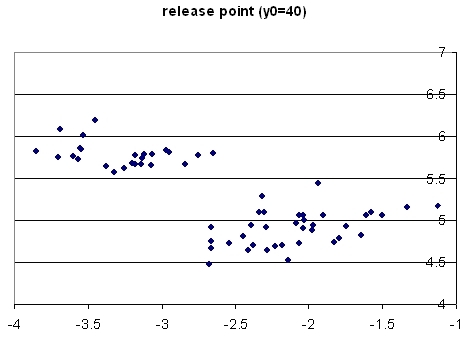 Note that when you plot with y0=55, the points are all bunched together, meaning that there is not much scatter in the “actual” release point (i.e., the location when the ball actually leaves the hand). When you take y0 closer to home plate, the location of the pitches spread out, depending on the speed, spin, spin axis, etc. If you compute for y0=1.416, you are getting the location at home plate. 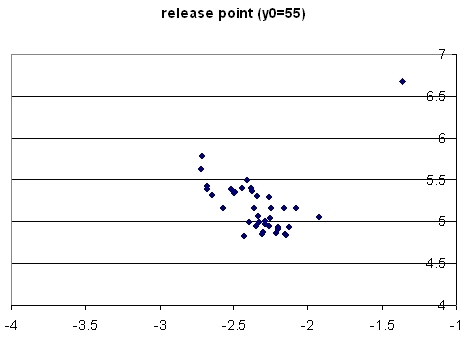 It is probably not correct to refer to this as “release point” for anything other than y0~55. 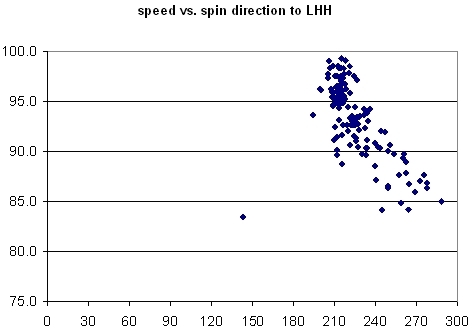 When I looked at spin vs. v for Jon Lester, I didn’t see the large correlation. I think the difference is the Paps is mostly throwing hard stuff, and Lester throws a lot of off-speed stuff. For fastballs and sliders, I would expect a correlation between speed and spin, but not so for a curveball (which has more spin than you would expect by simply extrapolating to lower velocity from the fastball). I would be interested in hearing other opinions about this. 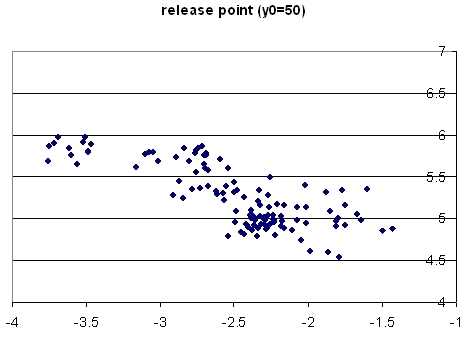 I forget sometimes and play fast and loose with the term “release point”. When we started out the year, we were at y0=55, so that parameter is stuck in my head with the name release point, even though that’s not really what it is anymore. I tried to clarify that in my post. 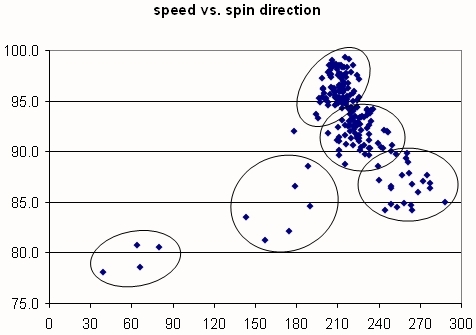 You’re probably right about the high correlation between speed and spin rate being restricted to fastballs and sliders. If you look at Papelbon’s graph, the correlation is better for speeds greater than 90 mph, and below that line it’s a pretty loose correlation. 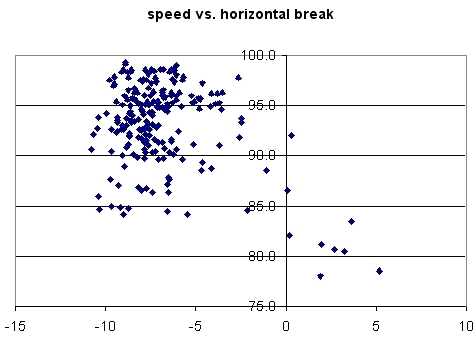 Alan, as I thought about this a bit more, the reason I am excited about using just speed and spin direction to make one illuminating graph is that it’s usually the fastballs and sometimes the hard breaking pitches that are toughest to tell apart. Changeups and curveballs are, generally speaking, pretty easy to identify. I’m not saying that spin magnitude is useless information. Like a lot of other parameters, it can be valuable in any number of situations, and is certainly part of building the whole picture about a pitcher. 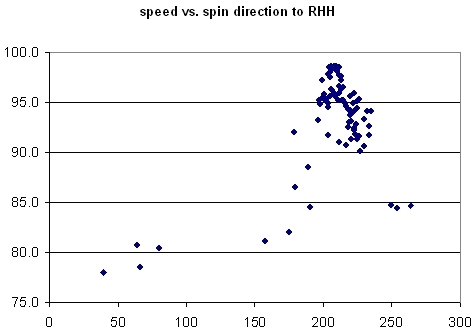 But in looking for THE ONE GRAPH to sum up a pitcher, so far speed versus spin direction looks like the best candidate. Excellent work here Mike. I am really glad you published it. One thing to think about is to make your plots just for games at Fenway so you don’t have to worry about the error from park to park. 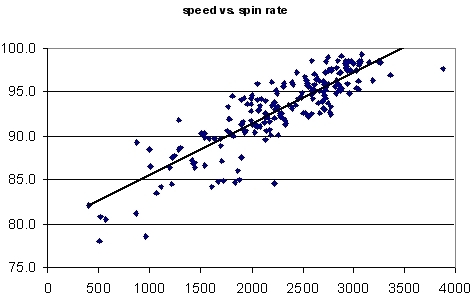 You might find that the correlation actually improves for spin rate and speed for Papelbon at least. Then if it isn’t to hard to make a plot like that for Zito or Rich Hill you should be able to answer the curve ball spin rate question. 1. I use Kaleidagraph to do all my plotting, and polar plots are possible with it. You could also probably figure out how to do it using Excel if you write the appropriate macro (but I have not figured out how to do that). 2. I don’t know anything about WordPress. There are LaTeX to html converters, but I doubt they are very good. I am a big user of LaTeX for all my scientific writing. If you figure out how to do web articles in LaTeX, let me know.